Our hectic lives are filled with so much sound. Noise of all kinds, from traffic, from planes passing low overhead, the neighbour’s lawn mower. People talking, be it work mates, family or friends. Overly enthusiastic kids on the bus or that businessman who just has to let everyone listen to his very important phone call in the quiet zone on the train. We also (at least many of us) fill our lives with sound by our own will. Music in our ears wherever we go, in the city or out running. Many people say they are afraid of the silence. They need to have sound in the background to feel comfortable. I have never understood it. I use to say that the best sound of all is the sound of silence. Silence gives me room to be, to think and to feel. By silence, I don’t necessarily mean complete absence of any sound. For example in nature, it is rarely complete silence, but if you sit down and listen to the silence you hear all the sounds of nature. The wind whispering through the treetops, the singing birds or the splattering of water in a stream. A couple of days ago I grabbed my camera and went out to shoot sunset at this tarn, not far from home. It had been a warm and cloudless day, so I didn’t expect too much. But as I got there a cloud cover had appeared, and the low sun spread this gorgeous light above the trees. There was not a breath of wind and the water lay still as a black mirror. Nobody else was around, only an abundance of birds, that I could hear but not see. And that’s all the music I need when I’m out. It makes me feel connected to nature, to the universe. It makes me relax and gather energy to cope with the everyday struggle. 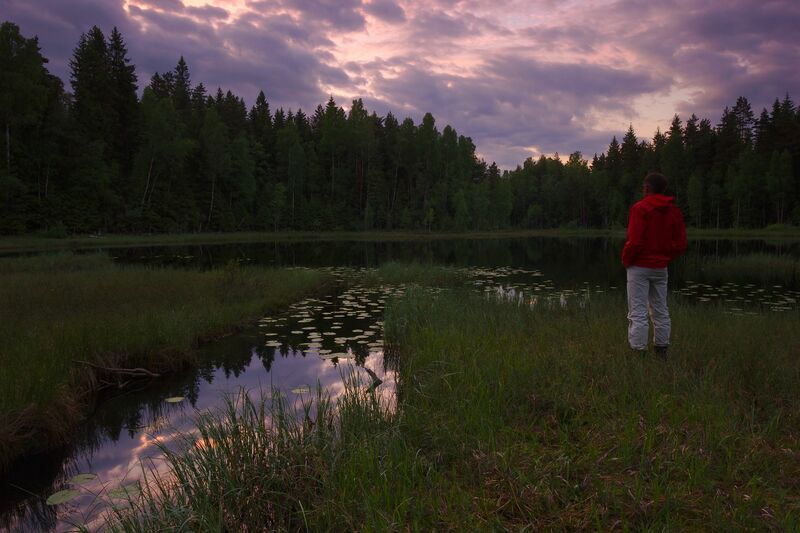 Now, after this rather philosophical piece, turn of your music, listen to the silence and enjoy these two images from a late evening in the forests of Eastern Norway.